(Bloomberg) – South African media company Naspers Ltd. is cashing in a tiny sliver of one of the greatest venture-capital investments ever. The company is selling $10.6 billion of shares in Tencent Holdings Ltd., equal to 2 percent of the stock in the Chinese operator of the WeChat messaging service, the Cape Town-based company said in a statement Thursday. Naspers might have remained an obscure publisher of South African newspapers and operator of pay-TV services if not for its decision in 2001 to invest $32 million in Tencent, a then little-known Chinese startup. The stake is now worth $175 billion and given that Naspers has a market value of about $125.5 billion, it means investors place no value on Naspers’ other operations and investments. Chief Executive Officer Bob Van Dijk has been trying to reduce the discount by looking for new investments to replicate the Tencent success; he’s put cash into a range of internet companies from the U.S. to Russia and India. Naspers will use the money from the sale of Tencent shares to invest in its classifieds, online food delivery and fintech businesses and make other investments, it said. The sale of 190 million shares, worth $10.6 billion based on Tencent’s closing price in Hong Kong on Thursday, will cut the stake held by Naspers to 31.2 percent from 33.2 percent. It’s the first time Naspers has reduced its holdings in Tencent since investing in the company. 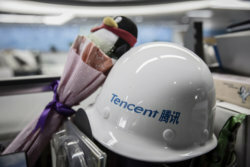 Naspers won’t sell more shares in Tencent for at least three years, it said. Naspers shares fell 4.2 percent to R3,315 at 12:05 p.m. in Johannesburg. Investment bankers at Bank of America Merrill Lynch, Citigroup and Morgan Stanley are offering the shares to institutional investors. The sale should close before the Hong Kong market opens on Friday, Naspers said.